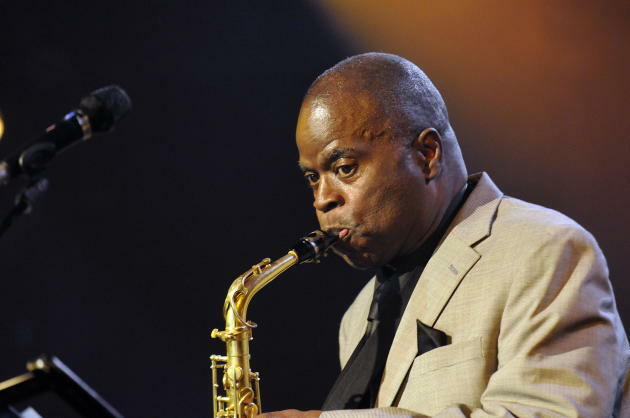 Of course, you could count on Maceo Parker to put the funk in the second annual Funk ‘n’ Roll Weekend sponsored by the PRN Alumni Foundation. Not only is the veteran saxophonist an alum of Prince’s organization but he played many years with James Brown. So you knew he’d be super funky on Thursday night at Aria in Minneapolis’ North Loop. Backed by a stellar band featuring Purple alums Candy Dulfer on alto sax and Greg Boyer on trombone, Parker offered various flavors of soul, jazz and funk. There were unstoppable JB grooves with a little JB-inspired dancing by the 75-year-old Parker. There were winning instrumental covers of Marvin Gaye’s “Let’s Get It On” (by guitarist Bruno Speight), Average White Band’s “Pick Up the Pieces” (starring Dulfer) and Michael Jackson’s “The Way You Make Me Feel” (by Boyer). Decked out in a purple shirt and necktie, the enthusiastic Parker had a message to send throughout his performance: Love will conquer all. He even periodically held up a ceramic sign L-O-V-E. Whether he was blowing his sax, dancing in the audience or leading the band, Parker seemed to be having a grand time. In fact, he wouldn’t leave the stage, carrying on with extra encores, stretching his performance to 110 minutes. Earlier in the evening, PRN Alumni Foundation board members explained how they are carrying on Prince’s charitable ways. Money has been donated to a music therapy school called the Music Settlement; the Urban Farming nonprofit started by ex-Paisley recording artist Taja Sevelle, and Rosie Gaines, a former NPG singer/pianist who is suffering from mental illness, as her daughter Latoya Gaines explained. The Funk ‘n’ Roll Weekend continues on Friday with bowling at Memory Lanes – the “roll” part of the weekend? – and an acoustic performance by 1990s Purple protegee Ingrid Chavez at Prime 6. On Saturday, various former Paisley Park staffers will discuss Prince in panels at the Capri Theater in north Minneapolis. By the way, PRN Alumni board member Craig Rice told the crowd on Thursday that he, Prince and Gilbert Davison looked at Aria, formerly the Jeune Leune theater, as a possible space for Glam Slam, the nightclub that the Purple One eventually opened in the Wyman building.